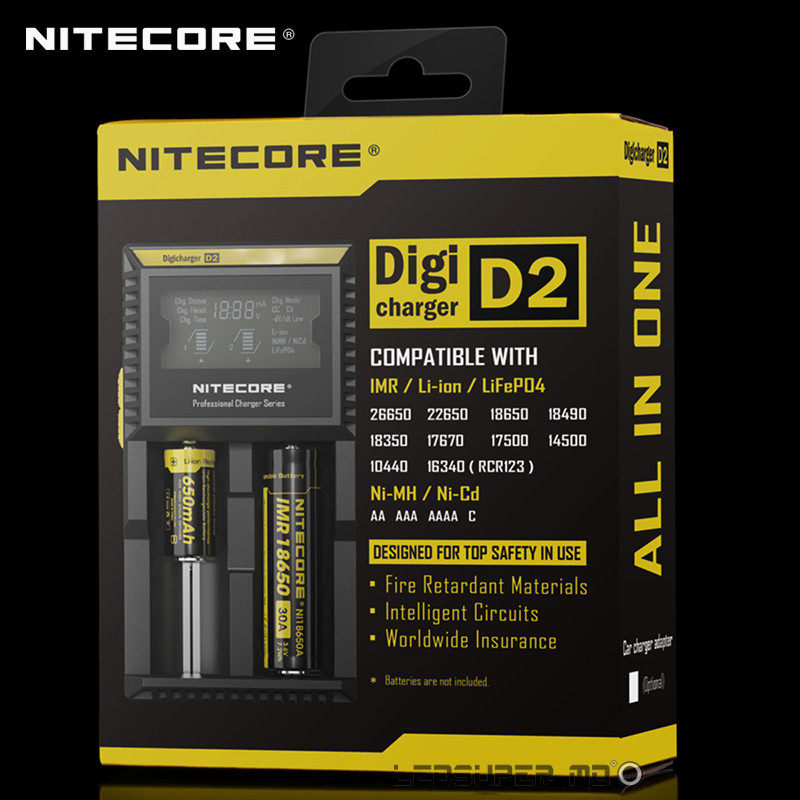 What is packaging of Nitecore D2 Battery Charger? What are Details of Nitecore D2 Battery Charger? The Nitecore D2 Battery Charger is a universal smart charger compatible with almost all cylindrical rechargeable batteries, thus eliminating the need to own several chargers. The Battery Charger D2 automatically detects Li-ion, Ni-MH and Ni-Cd batteries, and through manual selection is also capable of charging LiFePO4 batteries. Intelligent charging circuitry selects the optimal charging mode (CC, CV and dV/dt) for a given battery and each of the D2\'s two microcomputer-controlled charging slots then monitors and charges the battery independently. Furthermore, an integrated digital LCD screen clearly displays charging progress, voltage, current and time while an intelligent automatic power-off function terminates current when charging is complete. The Nitecore D2: The world\'s most advanced fully-automatic digital Battery Charger. It\'s as simple as insert, detect and charge. Features • Capable of charging 2 batteries simultaneously • Each of the two battery slots monitors and charges independently • Compatible with and identifies Li-ion (26650, 22650, 18650, 17670, 18490, 17500, 18350, 16340(RCR123), 14500, 10440), Ni-MH and Ni-Cd (AA, AAA, AAAA, C) rechargeable batteries • Optimized charging design for IMR batteries • Integrated LCD panel clearly displays charging parameters and progress • Two conveniently located side buttons allow easy selection of specific battery types and charging parameters • Intelligent circuitry detects the battery type and status before entering automatic charge mode (CC, CV, dV/dt) • Automatically detects battery power status and selects the appropriate voltage and charge mode (with the exception of LiFePO4 batteries which require manual selection) • Compatible with LiFePO4 batteries • Compatible with small capacity batteries • Automatically stops charging when complete • Features over-charge prevention to protect batteries • Features temperature monitoring to prevent overheating • Made from durable ABS (fire retardant / flame resistant) • Features reverse polarity protection • Designed for optimal heat dissipation • Certified by RoHS, CE, FCC and CEC • Insured worldwide by Ping An Insurance (Group) Company of China, Ltd. THE D2 IS RESTRICTED TO CHARGING Li-ion, IMR, 3.7V LiFePO4, Ni-MH and Ni-Cd RECHARGABLE BATTERIES ONLY. NEVER USE THE D2 FOR OTHER TYPES OF BATTERIES AS THIS COULD RESULT IN BATTERY EXPLOSION, CRACKING OR LEAKAGE, CAUSING PROPERTY DAMAGE AND/OR PERSONAL INJURY. All NITECORE® Battery C harger s enjoy a comprehensive after sale warranty service. A malfunctioning NITECORE® Battery Charger may be exchanged for a replacement by a local authorized distributor/dealer within 12 months of purchase. Beyond 12 months, the warranty covers labor costs and maintenance with the exclusion of accessories or replacement parts. The warranty is nullified in any of the following situations: 1. The Battery C harger (s) is/are broken down, reconstructed and/or modified under unauthorized conditions. 2. The Battery C harger (s) is/are damaged through improper use. 3. The Battery C harger (s) is/are damaged by leakage of batteries.